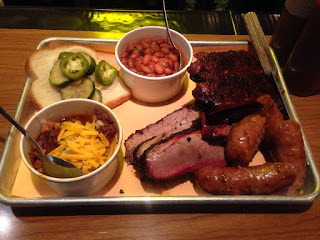 Jack Timmons, who came from Texas by way of Microsoft, claims that the BBQ in Seattle now is better than in Texas, which he attributes to "raising the beef in a more moderate climate. You don't have to cross-breed and harden your stock to survive a hotter summer or colder winter." (eater.com) I don't know if he's going to persuade anyone with that, but he serves up some pretty compelling arguments from two mammoth smokers burning hardwoods shipped from Texas. It is Central Texas style -- Timmons explains "Well, you know, I grew up in Dallas, and the barbecue there wasn't that great by today's standards. East Texas is really no different than Louisiana barbecue. Lots of sauce, use of pig, and fried stuff. In West Texas you cook over a coal fire. And in South Texas you bury stuff in the ground — it's called "Barbacoa. Now in Central Texas you cook in an offset smoker with a clean wood fire. A lot of flavor comes from that." (ibid) As per the web site, the food is "based on the BBQ style started in butcher shops in Central Texas in the late 1800’s. Beef and pork with a simple salt and pepper rub, smoked low and slow over hardwoods (post oak, mesquite, hickory, pecan), and served on butcher paper. Sauce is optional, along with pickles and white bread." Timmons began hosting "Seattle Brisket Experience" events, and moved into this roadhouse like space in south Seattle after Bogart's closed. The events gave him a reputation as Seattle's "King of Brisket." As of 2018 he is serving it at Mariner games in Safeco Field and expanding to a second location in South Lake Union. And he is also serious about his liquor. They have an extensive, creative cocktail menu (carbonated margaritas on tap), some good local craft beers (along with Shiner Bock), a small, nice selection of wines, and an ongoing series of events in conjunction with local distilleries and brewers. Try the Smoked Old Fashioned.